It’s not at all surprising to see the Ford Mustang achieving impressive sales figures in its American home market. Through the first five months of 2015, Ford has sold 56,571 Mustangs in the U.S., a 55% year-over-year increase. That 20,000-unit improvement compared with the first five months of 2014 has stopped overall Ford passenger car figures from looking dreadful as the C-Max, Fiesta, Fusion, and Taurus all decline and the Focus stagnates. But this was easily forecasted. 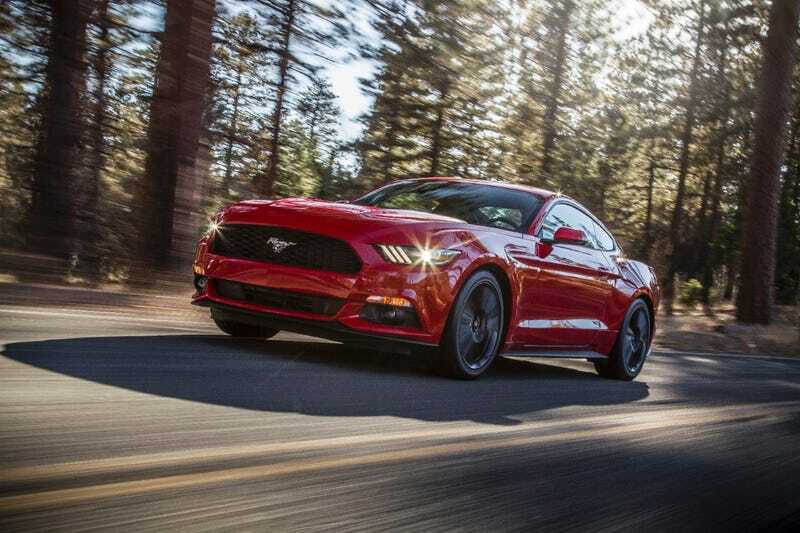 The Mustang is all-new and significantly improved, even in V6 trim, for the 2015 model year. The Ford’s most direct rival, Chevrolet’s Camaro, is at the end of a near-seven-year fifth-generation run and its successor has already been revealed. Another key competitor, the Dodge Challenger, is a rare beast in its most oft-discussed trim, the Hellcat, and while thoroughly refreshed, isn’t a completely new package. The three cars combined for 120,721 U.S. sales between January and May, and despite the Challenger’s massive increase – 2015 is set to be the Dodge’s seventh consecutive calendar year of growth – the Mustang’s share of the trio’s market climbed from 38% at this stage a year ago to 47% in 2015. 47%? Ford Canada laughs at that figure. Between January and May, the Mustang’s share of the segment in Canada settled in at 52% thanks to a 32% rate of expansion compared with the first five months of 2015. Except in Canada, this is nothing new. It’s not a result which can be tied exclusively to the Mustang’s newness and the Camaro’s age. 2015 is on track to be the fourth consecutive year in which the Ford Mustang outsold the Chevrolet Camaro and Dodge Challenger – combined – in Canada. Ford’s overall strength in Canada can be partially credited. While Chevrolet’s General Motors parent company is the highest-volume automobile manufacturer in the U.S. with 17.7% market share this year, GM Canada’s market share is just 13.6%. The Ford Motor Company, on the other hand, is routinely Canada’s top-selling manufacturer (albeit 13,595 sales back of FCA so far this year) and the company’s market share north of the border is more similar to its market share in its home market. Yet the Canadian figures do lack a measure of consequence. Even as Canada’s auto industry tracks toward a third consecutive record sales year, sporting cars (particularly rear-wheel-drive performance cars) eat a much smaller slice of the pie in Canada compared with the U.S. appetite. Consider the Mustang as a prime example, as nothing else of the kind sells nearly as often in either country: Mustang sales in the U.S. are 17 times stronger than in Canada so far this year. The overall auto industry’s volume in the U.S. is only nine times stronger; pickup truck sales are only seven times stronger; Ford F-Series sales are only six times stronger. The fifth-gen Camaro and the current Dodge Challenger are assembled in southern Ontario. Which is in Canada. Ford builds the Mustang in Flat Rock, Michigan. Both the Mustang and Camaro have the advantage of being sold in convertible and coupe form. The Challenger is hardtop-only.